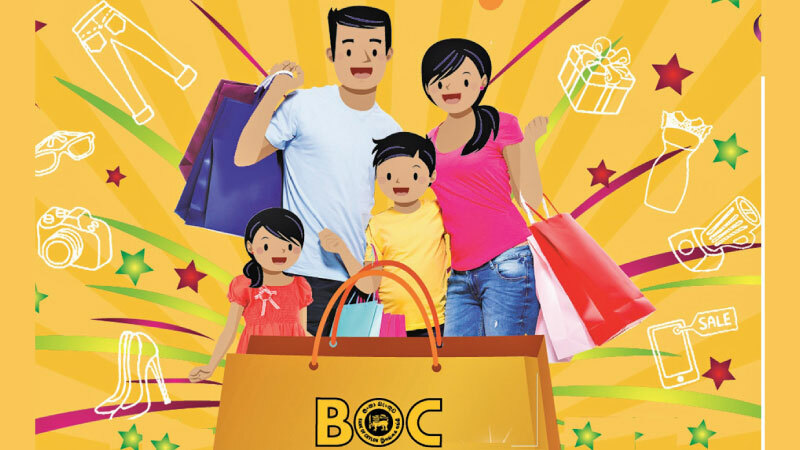 The Bank of Ceylon’s BOC Card holders to enjoy shopping for Avurudu with their families as they can enjoy the highest discounts during the Avurudu period. The Bank offers discounts for both its Credit and Debit Card holders at popular shopping outlets across the country. Having over a hundred outlets to choose from, BOC Card holders can enjoy this promotion throughout the Avurudu season on selected days, many till April 30, 2019 and some popular leisure destinations as long as July 2019. This Special Avurudu discount promotion covers textile and apparel, footwear, jewelry, hotels and spa, restaurants, toy shops, bookshops and on line shopping offers. Many popular retail outlets such as House of Fashions, Hameedia, Rich look fashion, Super Fashion, Spring and Summer, Saree Mandir, Envoy, Emma, Diliganz, GCS, TFO Factoy, Galle City, Sunimal’s, Piyarathna, Richway, Bellro, aditi infinity, Hammaa, Shirtworks, , envoy Mansion, Addidas, Crocodile, Beverly Street, Fashion Bug, Cool Planet, CIB Group, Hemantha textile, Saffan’s, Shoe Fashion, Bata, Baby care, the kids warehouse, kids hub, Kid lands and Panther offers discounts up to 30%. Popular Jewelers who have come on board are Fior Drissage, Raja Jewellers, Chamathkara, Raja Jewellers, Blue Diamond, Mallika Hemachandra and Stone and String . Apart from this seasonal Avurudu offer, BOC Card holders can exclusively avail themselves of this opportunity to enjoy their holidays with massive discounts up to 50% at Aliya, Kithala, Malu Malu, Ragala, MOUNTBATTEN, Eden Group, .Dickwella Resort, Okray Gray hotels, Lavindish Group, Swiss Residence, and many other. Understanding the changing requirements of customers, BOC Credit Cards have arranged many benefits for you such as the lowest interest rate in the market, travel insurance cover up to USD250,000/-, free lost baggage insurance cover during air travel, emergency hospitalization limit enhancement facility, loyalty points and point redemption facilities, 50% cash advance on availability of a credit limit once a month at any ATM, 52 days (maximum) interest free credit, supplementary card for third party with a flexible limit, free SMS alert facility, easy settlement plans at our merchant network up to 24 months. “Being a responsible bank BOC offers a range of cards that are designed to fit the customer’s requirement and capacity. BOC Visa Cards come in the range of Platinum, International gold and International classic, its MasterCard option offers Titanium range and WorldMaster, WorldMaster GMOA affinity cards are also available,” stated Deputy General Manager Product and Banking Development, M.J.P. Salgado.